The Vestry records for St Mary's Church make reference to the Watch House and pillory or stocks. The Watch House itself was referred to by a variety of names including the Cage, lock-up, Crosshouse, and Round House. It also becomes apparent that over a period of time it was moved to different locations at least twice. When in August 1640 John Greene of Twickenham was sentenced to spend 6 hours in the stocks, the Quarter Sessions made the punishment take place at Brentford on a market day. But when the same Sessions in October 1699 sentenced Thomas Webb to be put in the Pillory, the order was for Webb to spend 1 hour in the Brentford Pillory on a market day, and 1 hour similarly at Twickenham. In fact, Twickenham appears to have made provision for a Watch House, lock-up, and whipping post in 1684 when, on 1 February the Vestry ordered that the "crosshouse” was to be boarded up and "made in ye manner of a cage with a strong lock and keye, and also the Stocks be repayred and a whipping post to be new set up” within a fortnight. This Crosshouse was erected in the centre of Twickenham. New arrangements were made by the Vestry on 11 May 1696 and the "Crosshouse" was allotted to William Leaver, the Beadle together with a payment of 20 shillings "for to ward within and about this Parish and to keep all Beggars and Vagabonds that shall lye abide or lurk about the Towne and to give correction to such..." The position of the "Crosshouse" was given as lying "at the Sundial in the middle of the Town". Three years later, in 1699, William Leaver was appointed "Warder" for the Parish with an allowance of £4 together with a new coat, cap, and staff. In 1737 the Vestry engaged Edward Reeves, a local man, to construct a Watchhouse, for which he was paid £20.This building also was in the middle of the town, but in April 1764 the Vestry decided that it needed to be removed to a new site by the Church wall, close to the Engine House (i.e. for the fire engine). This removal was possibly aborted, since in September 1764 the Vestry agreed that the stocks and "cage" should be moved to a suitable site upon the Common, at a dry spot near to the "Gateway". The western gate to the town, shown on Samuel Lewis's map of 1784 stood where the railway crosses the end of Heath Road today. Later still, in October 1790 the Vestry ordered that a Whipping Post should be installed at the Workhouse itself. 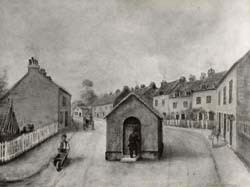 The Workhouse had been built in 1725 on land to the north of what is today Twickenham Green. This move of the Crosshouse, Round House, or Cage took place at the end of 1764 or 1765. It may have stood, at first, on land at the junction of Colne Road and Heath Road, being moved later. Warren's map of 1846, based on the Enclosure Award map of 1818 shows a small rectangle in the road at this point and it is tempting to claim that this was the actual building. There exists a print of the 1840's which shows the building with what looks like a “peeler' in his top bat standing outside. (A copy of this print is in the Local Studies room in Richmond Library).Its exact position then was at the junction of May Road and Colne Road. The Watch house may have been another small building altogether. There is a print of St Mary's Church showing a small cabin standing at the corner of the churchyard wall, in 1796. This might have been for the use of a night watchman, positioned to secure protection of the church from vandals. In 1698 the churchyard gates had been flung into the river one night, by "Drunkards". Session held at Hicks Hall 26 August 1640. (from the Middlesex Sessions Book Calandar 1639/44, page 43. GLC Record Office typescript). Information is given to the Court by Mary Humber of the Parish of Twickenham, widow, that John Greene, of the same parish, labourer, suffered his dog commonly to go to the pest house there amongst the persons infected with the plague and he was admonished by John Browne, one of the Justices, to kill the dog lest others should be endangered by the infection; that the said Greene not only refused to do so, but threatened to kill the said Mary Humber for complaining against him to Mr. Browne; that in prosecution of his malicious intention, he ran after the said Mary with a club in his hands so that she was 'much freighted and forced to take her house and to shutt her dores against him'; that with much violence he endeavoured to break open her door and then failing in his purpose, threw water, dirt, filth and excrement upon the “turffes” which she had, provided for fuel, which he spoiled to the value of eight shillings; and did 'otherwayes most intolerablie and inhumanly misbehave himself'. Order made for the said John Greene to be put in the stocks at New Brainford on a Tuesday in open market, from 9 o'clock in the morning till 5 o'clock in the afternoon, with a paper upon his head, with these words in capital letters 'FOR HIS MISDEMEANOUR IN INDEAVOURING TO DISPERSE THE PLAGUE'; to be taken �o the House of Correction, there to remain until he shall confess the injury done to the parish of Twickenham, and ask forgiveness of Mary Humber for the wrongs done t0 her, to make satisfaction for the turffes which he spoilt, and to find sureties for his good behaviour. (from the Middlesex Sessions Book Calandar 1639/44, page 43. GLC Record Office typescript). Where the Pest House (short for "pestilence") stood or for how long is not known; no reference to this building or its use has been seen in the Church archives. It is likely that such a building would have been placed well away from habitations, possibly somewhere to the west of the town, on the Common. It is possible that it was administered by the Overseers of the Poor, but 17th century accounts have only survived for the years 1661 to 1678. John Browne, Clerk of the Parliaments was living at this time in the Manor House in Church Street. ...for to ward within and about this Parish and to keep all Beggars and Vagabonds that shall lye abide or lurk about the Towne and to give correction to such..